They hoped to use compromised media channels like the BBC to peddle these lies that they had an agreement with Kanu when such never happened. Okezie Ikpeazu is a mass murderer cited at the ongoing case review by ICC at the Hague. He is also indicted in the ongoing lawsuit in the USA. He has been rejected by the public along with his other Fulani Islamic servants at Government Houses across the South East, so lying against Mazi Nnamdi Kanu or using his name is the only way to gain relevance and sympathy. Anybody who believes in anything coming out of the mouth of an Igbo governor or Nnia Nwodo led Ohaneze Ndigbo needs psychiatric help. 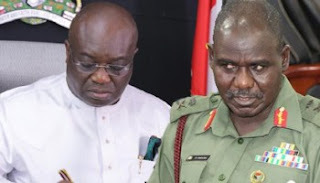 Okezie Ikpeazu should keep his testimony and evidence with him because he will soon be called upon to give account of his role in the military invasion and abduction of Nnamdi Kanu and his parents from their home. We are placing the world on notice that Okezie Ikpeazu has never met with our leader Mazi Nnamdi Kanu despite the fact that Umuahia government house sits on his ancestral land and his father the traditional ruler. Gov. Okezie Ikpeazu is an unrepentant liar in the mould of other Igbo Biafra traitors before him. The day of reckoning is fast approaching and when that arrives, there will be no amount of Ghana Must Go bags or Hausa Fulani soldiers to defend them.